Stray dogs are held 3-5 days before they are put up for adoption or destroyed. Some of these dogs may have been claimed, rescued or euthanized. DO NOT phone the center to check whether your lost dog is there. Hundreds of dogs pass through the center every week. It is not possible for the staff to recognise your dog among the 140 dogs at the center. Visit the center everyday during their opening hours. 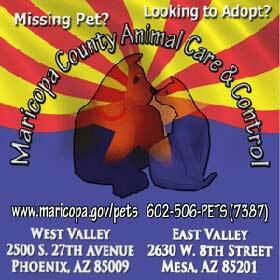  Check the list of found dogs on the MCACC Twitter account twitter.com/@nolostpetsmc. This page updates every 30 minutes and indicates the color, breed and where the animal was found.  Lost Dogs Arizona Lost Dogs Arizona is a network of volunteers helping reunite "lost" dogs with their families and "found" dogs with their owners.  Check the Found ads daily from the sites above.  Check the adoptable dog photo's on the Arizona Humane Society website. Post LOST DOG signs with REWARD on bright paper within a 2-mile radius of where dog was last seen. Animals from East Mesa and Queen Creek may end up at the Apache Junction shelter (see their photos here). Please license your dog, spay/neuter your pet, tag with a current phone number, and have your pet microchipped. 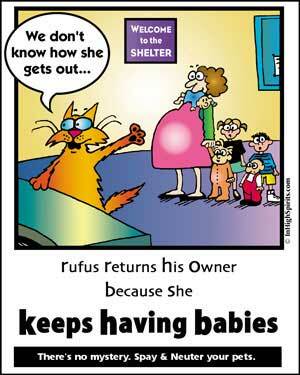 It may be the only way your pet can be returned to you. When Maricopa County Animal Care & Control say that a dog went to "New Hope" they mean it was put into their New Hope Program and passed to one of the 100+ rescue organizations that participate in this scheme. Read more about the New Hope Program in the Annual Report for 2013. Through its New Hope Rescue Program in 2014, MCACC transferred 12,129 dogs and cats to other animal welfare and rescue organizations. More than 40 Chihuahuas were sent to rescue groups in other states where the small breed is in high demand. Read about a rescue partner in the MCACC Newsletter here. Please contact the facility directly as hours may change. Monday - Friday: (adoptions, lost and found) 11:00 A.M. - 5:30 P.M.; (all other services) 9:00 A.M. - 6:00 P.M.
Saturday: (all services) 11:00 A.M. - 5:30 P.M.
Sunday: (all services) 12:00 P.M. - 4:00 P.M.
Rose was injured in a road traffic accident in Arizona. She was taken to hospital but her 10 month old dog Ily ran off into the desert. A large number of volunteers spent two months searching the desert for Ily. On August 26th 2013 Ily walked into a trap cage. Click here to see her being reunited with Rose a few hours later.